Like many states, Massachusetts has a state planning website for college Your Plan for the Future. It provides planning guidelines as well as tools to apply to colleges and scholarships and track related information. As usual, you’ll find a basic college search function but it includes all US colleges. You have to create a login to use any of the features. The Massachusetts Educational Financing Authority (MEFA) website provides a variety of useful resources including a college admissions toolkit and webinars. The site provides a basic overview of the financial aid process including a breakdown of the types of financial aid for the state. You can also find a list of various financial aid programs and scholarships for Massachusetts residents. The website also lists free admission and financial planning seminars around the state. If you are planning at starting at a community college, you’ll want to visit the MassTransfer. This site provides information to ease the transfer process from community college to state institutions. You can also use the Massachusetts College Online website to find college course offered online by a consortium of public institutions. The Office of Student Financial Assistance at the Massachusetts Department of Higher Education lists state specific grants, scholarships, and tuition waivers. The website includes FAQs about the program. Massachusetts has 65 four-year institutions with 500 or more full-time undergraduates. 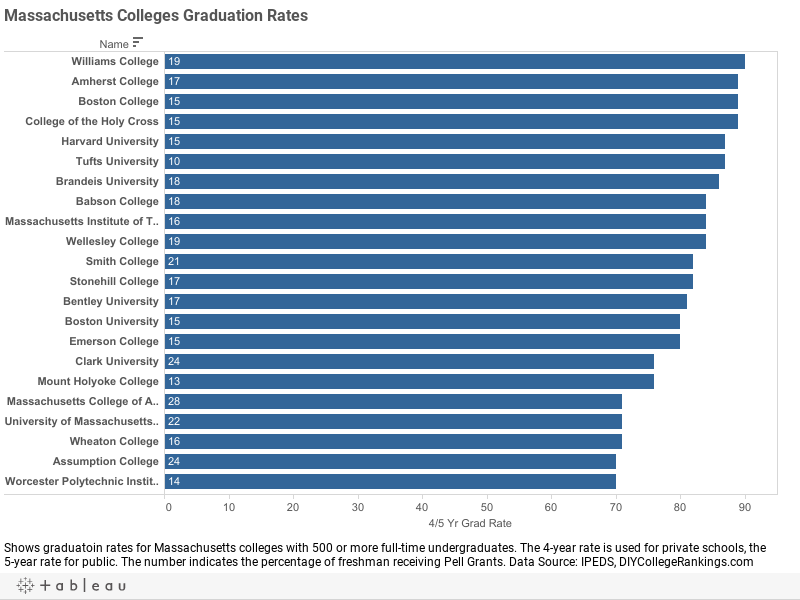 The 52 private Massachusetts colleges represent 66% of the enrollment while the 13 public universities account for 34% of the states 227,239 full-time undergraduates. The average four-year graduation rate for private colleges is 58.6% and the five-year graduation rate for public colleges is 51.6%. 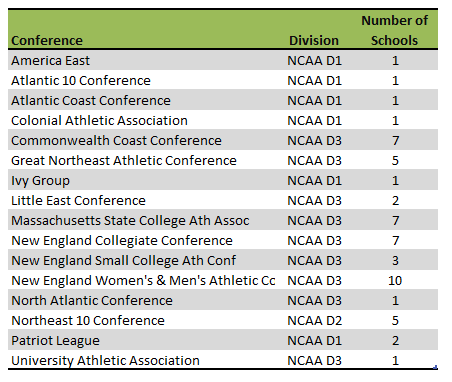 A total of 21 Massachusetts colleges meet the DIY College Rankings 50-50 profile requirements. The average SAT score for college-bound seniors in Massachusetts was 516 for Critical Reading and 531 for Math. The 75th percentile scores were 590 for Critical Reading and 610 for Math. A total 18 colleges had 75th percentile scores equal to or higher than the state in both categories.